The weather was not so good as the previous day when I woke on my second morning in Pisa, but other than a short debate with myself about whether to pack a hoody or a fleece I didn’t let it slow me down. Today I was catching a train to Lucca, a 30 minute journey from Pisa Central. The regional train networks in Italy are very easy to navigate. You don’t even have to attempt any Italian, all the stations have automated machines in four languages, including English. You simply type in where you want to go, put in the required euros and it prints you a ticket. Unlike the musical platforms of the British rail network, most trains at Italian stations leave from the same platform everyday, and because of that they are able to have a permanent departures board. 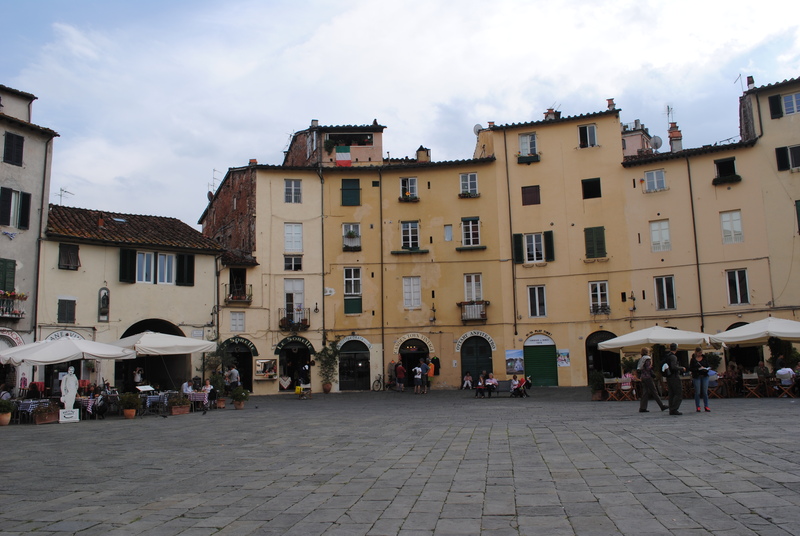 When I disembarked the train at Lucca, the first thing I did was head towards the tourist information at Piazza Verdi. There is a bus that will take you there, but I took my guidebook’s advice that it is quicker to walk. 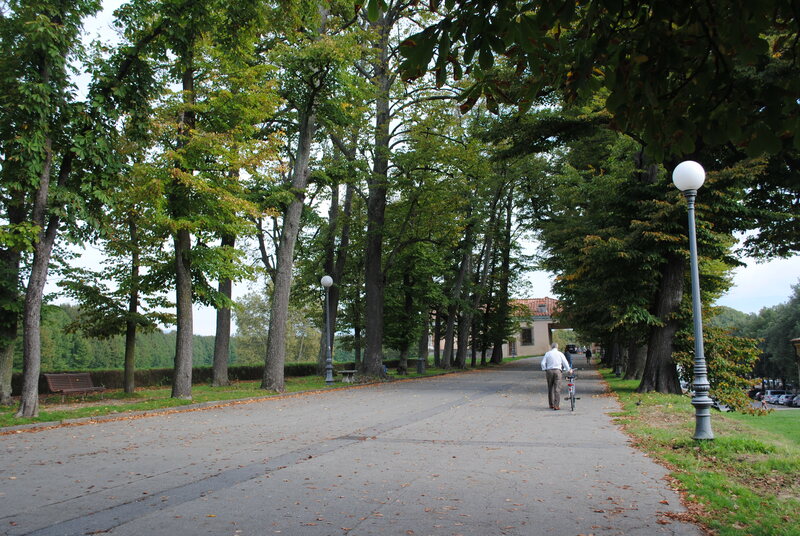 Lucca is surrounded by 12 metre high walls that were built to protect the old city in the 16th and 17th centuries. 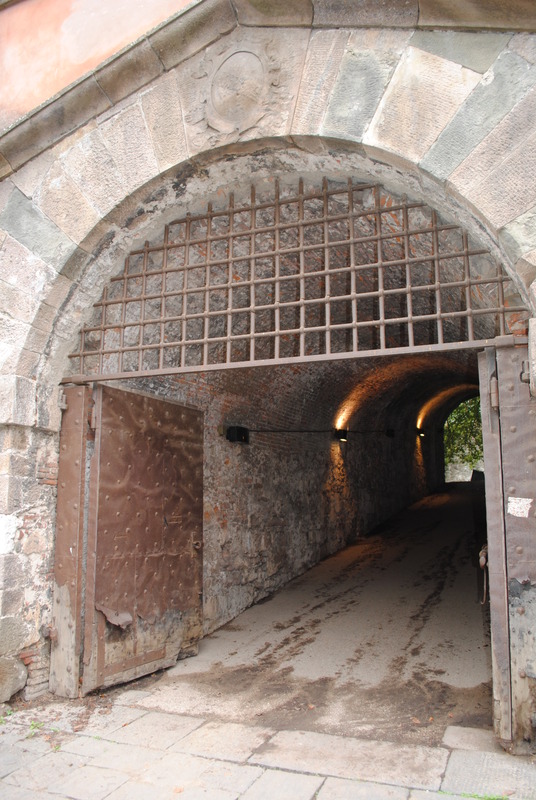 On top of the walls is a 4km long, circular footpath which was used as a track to race cars for a number of years in the 20th century. Each of the four principal sides are lined with a different tree species. As I entered the walls via the Porto San Pietro, one of the gates into the city, I could see why it’s quicker to walk than to take the bus. 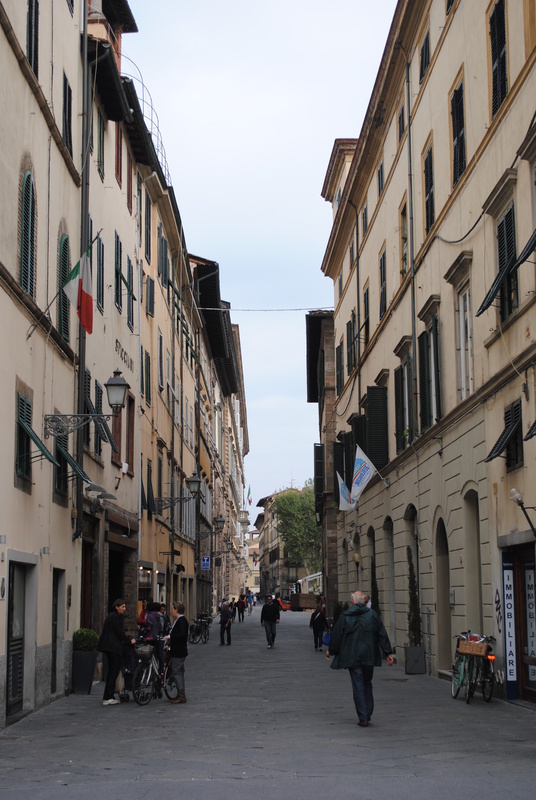 If I thought that the streets in Pisa were narrow and winding, here in Lucca they were positively claustrophobic. 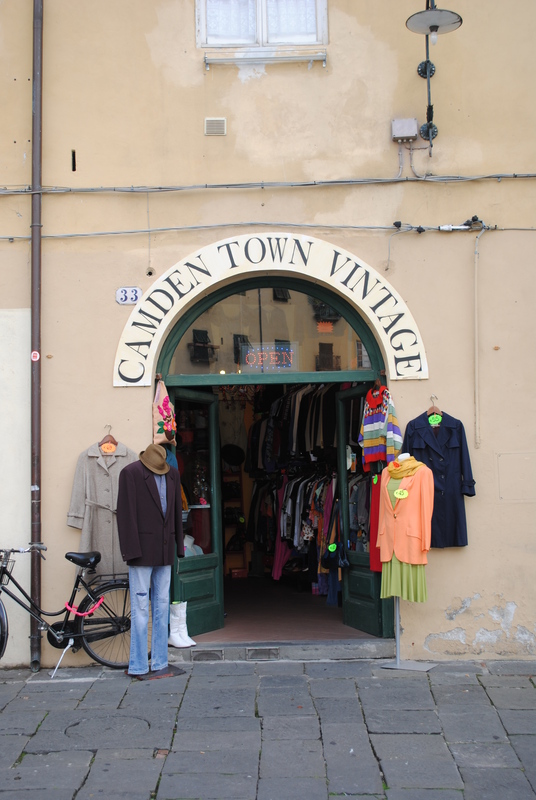 My camera was kept busy taking photos of all the picturesque buildings that I saw on my way to Piazza Verdi. Navigating the streets of Lucca is like trying to navigate a labyrinth, only with the added danger of pedestrians, cars, buses and bicycles flying at you from every angle. Although you’re supposed to stay on the right side of the road in Italy, here that rule seemed irrelevant, along with all the one-way signs and other signage that everyone seemed to be ignoring. I decided that my best plan of action was to act like I used to in Greece, go where I wanted to go and not worry about everyone else. My previous day’s walking around Pisa had left me with incredibly sore feet, so I’d decided to rent a bike for my day in Lucca. This would result in me having a very sore bottom after a couple of hours, but at least my feet would get a bit of a rest. 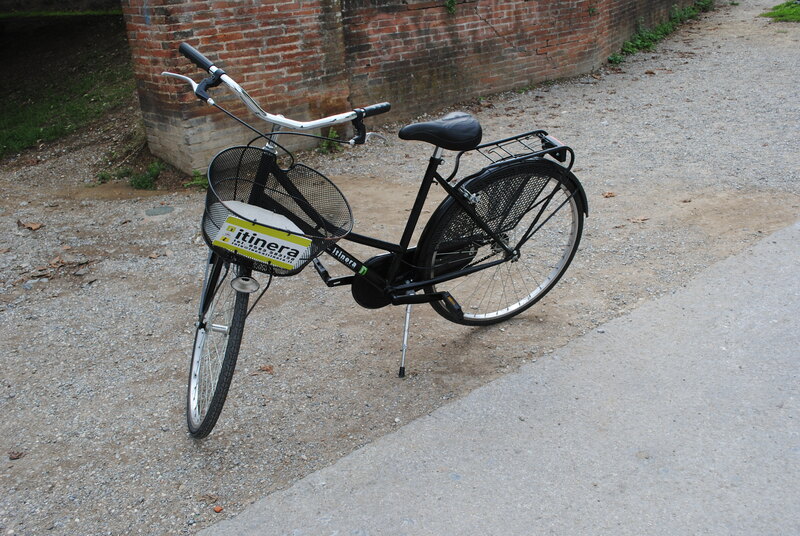 I rented my bike from the tourist information office, although there are multiple bike rental shops dotted all around Lucca. Bike rental generally costs €3 per hour, rising to €15 for the day. The tourist information offices also supply great, free maps of the city, essential if you don’t want to miss anything in a place that is so spread out and difficult to navigate. From Piazza Verdi, I cycled straight up onto the promenade on top of the city walls, and I am so glad I did. It’s like a whole other world up there, a peaceful, relaxed oasis surrounding the busy, loud old city below. The footpath along the walls reminded me of the park opposite my house, a beautiful space that is well used by local residents and visitors alike. To refer to it just as a footpath is a huge understatement. Joggers, walkers and cyclists take advantage of the open space to exercise, tourists take advantage of the photo opportunities from the high vantage point, diners enjoy their lunch in restaurants and cafes housed in converted old buildings and there are playgrounds full of happy children at regular points along the 4km circuit. The walls are also a lot easier to navigate the city from as you are able to drop back down into the commotion whenever you need to. Although reluctant to leave the enjoyment and serenity of the walls, I made my way down one of the steep paths and to the cathedral. I’d been told previous to my visit that entry to the cathedral costs €2.50. I wasn’t asked to pay, but that may have been due to building works at the time. 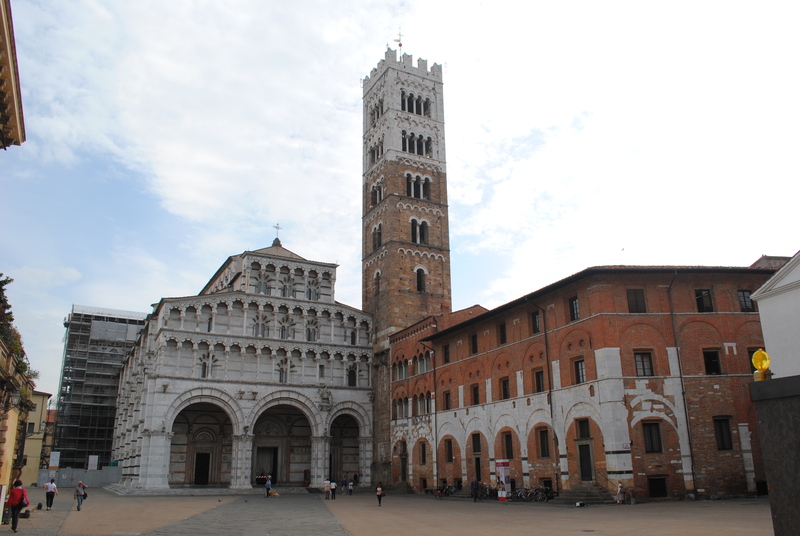 Lucca Cathedral, although not as grand as it’s more famous cousin in Pisa, is still a very impressive building. I particularly liked the frescoes on the ceiling with their deep blue backgrounds. 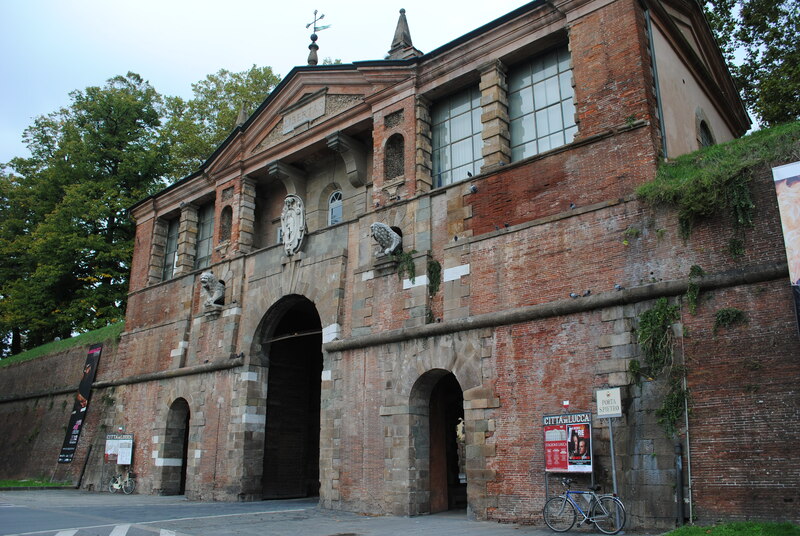 Next door to the cathedral, the Museo della Cattedrale contains artefacts from the cathedral. Unfortunately, the thought and attention to detail that is common place in the museums as Pisa has not been put in to practice here as well. Unless you take an audio guide, there is not much explanation as to what everything is. After paying €4 entrance, I was a little disappointed. Even though I wasn’t always sure what I was looking at, though, the exhibits were still beautiful. It still amazes me how much goes into religious artefacts. A bishop’s robe is not just a piece of decorative clothing, a tapestry is not just something to hang on a wall. Every symbol and image used is carefully chosen and exquisitely painted, sculpted or stitched to tell a story. Even books have their own covers made for them with minute detailing etched on the cover. 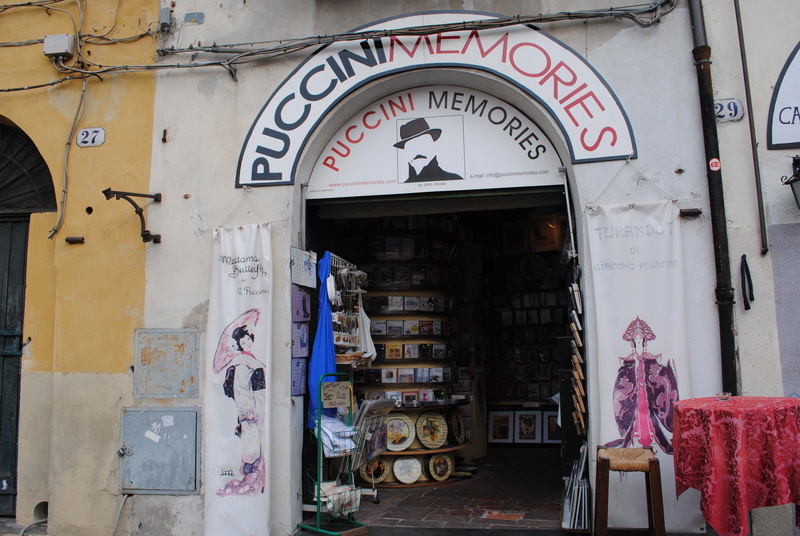 Here are some more photos of my day in Lucca. Lucca does look amazing! I wish I could have stopped there. It’s such a beautiful little town, I’d love to go back there some day. Hiring a bike and cycling around the walls is so much fun!